AuctionRPM screens are designed for efficiency and ease of input. The buttons are logically arranged to minimize guesswork and maximize productivity. 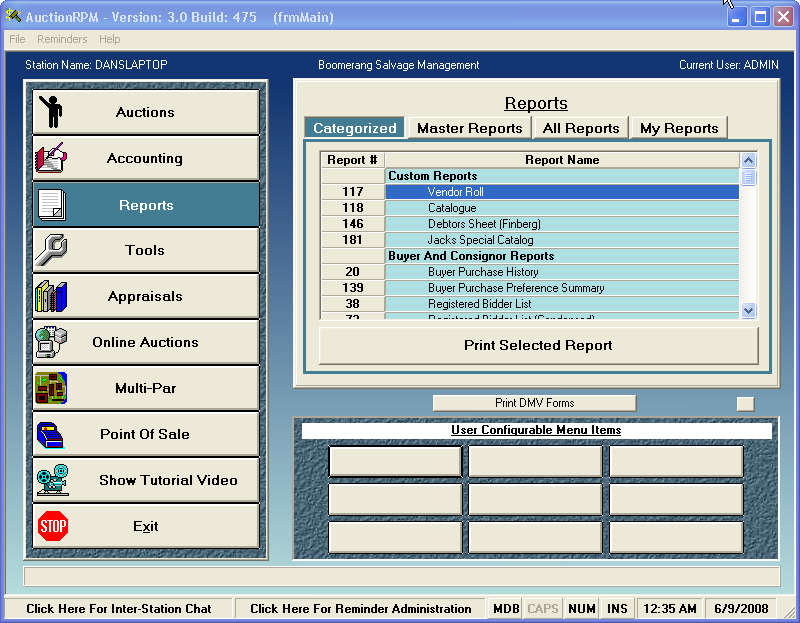 Buttons on the left side of AuctionRPM’s Main Menu represent functional categories such as ‘Auctions’, ‘Accounting’, and ‘Reports’. Think of these buttons as ‘umbrella’ categories, each a grouping of related functions. The ‘Auctions’ umbrella (button) covers everything from entering inventory to scheduling and lotting your auction to bidder registration to clerking (entering winning bids and bidder numbers). 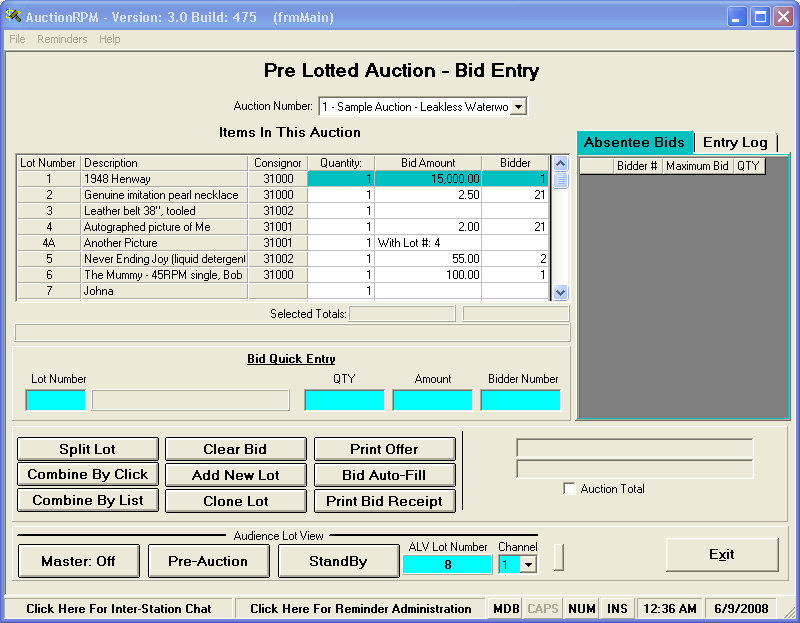 AuctionRPM includes clerking screens that are optimized for both pre-lotted as well as non-lotted bid entry (see below). Any functions that happen later in the auctioning cycle are found under the ‘Accounting’ umbrella. These include but are not limited to cashiering, invoice management, consignor and buyer expense maintenance, and consignor payments (you may either record consignor payments, or let AuctionRPM cut the checks for you). The ‘Reports’ section features over 215 reports covering all aspects of your operation. ‘Tools’ allows you to customize AuctionRPM to work the way you want it to. 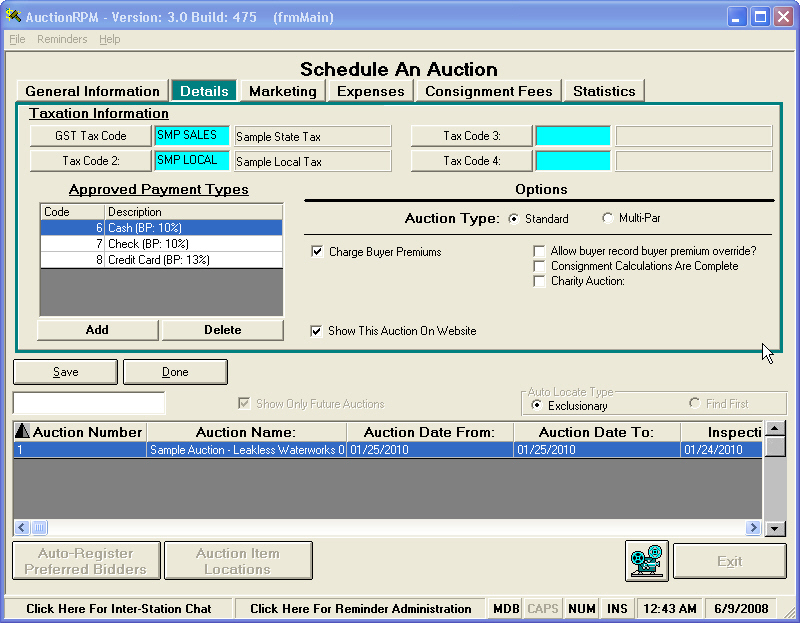 Scheduling your auction is simple. Enter the name, location and dates on the ‘General Information’ tab. Then, on the ‘Details’ tab, enter any taxes and payment types (‘cash’/’check’/’credit card’/ etc.). That’s all there is to it. 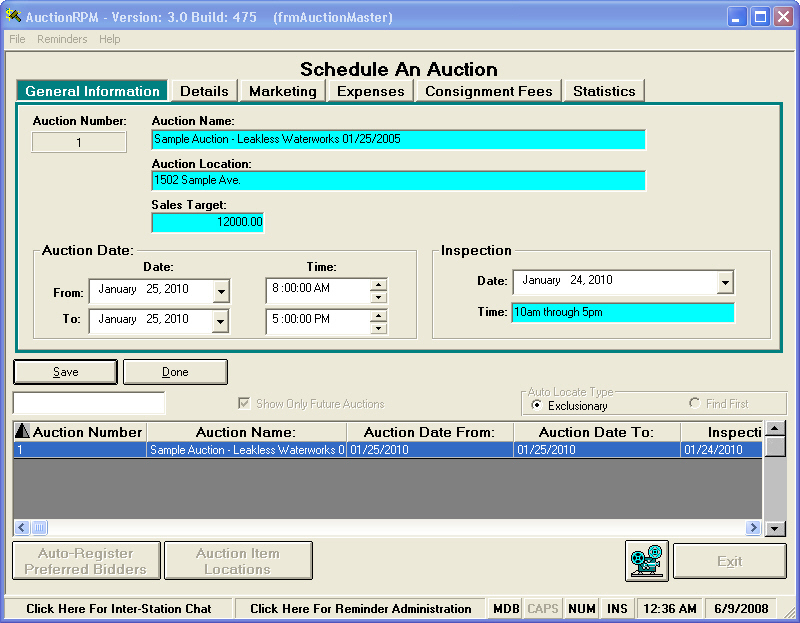 On this screen, you may add general auction expenses, set up mailing lists/labels by associating inventory categories with auction bidders. For more details on how to create mailing labels and lists, please see the ‘Mailing Labels’ tutorial located in ‘Tips & Tricks”, available from the main screen of this website. 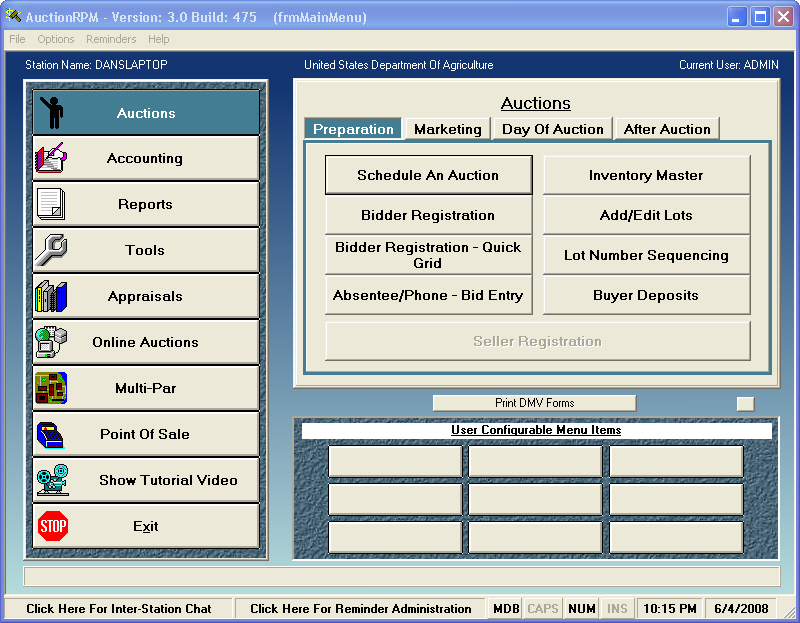 Clerking (entering of winning bid information) is generally performed on one of two clerking screens, each optimized for the type of entry, be it ‘pre-lotted’ (lots have been previously entered into the system), or ‘non-lotted’ (on-the-fly data entry). Lots may be combined, split, cloned, added, and, if desired, displayed on a separate monitor for your customers’ benefit (and added profits for you). 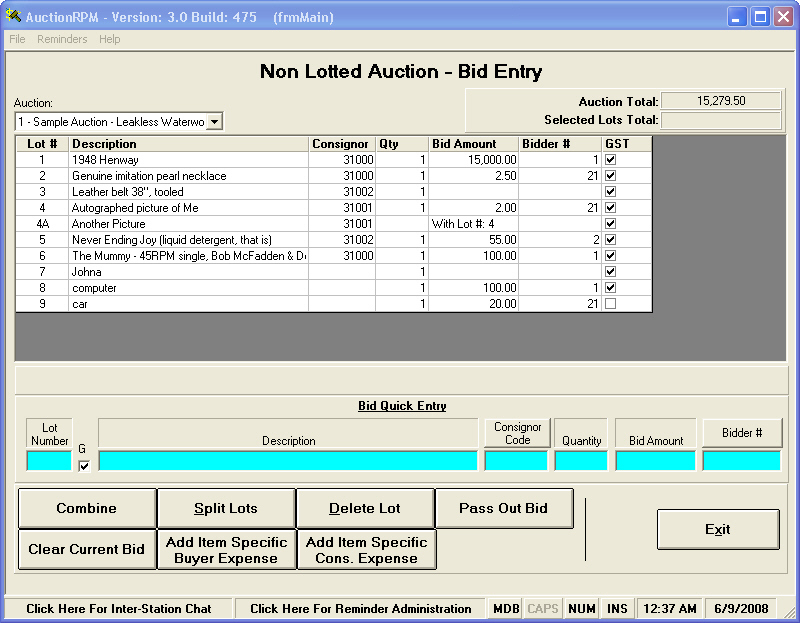 If you sell ‘on-the-fly’, the non-lotted bid entry screen is optimized for you. 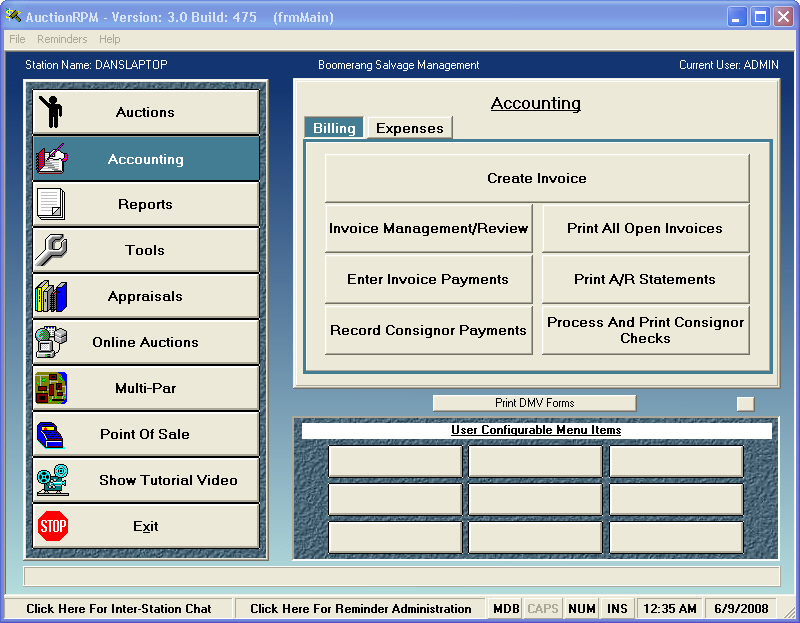 Automatic lot numbering, simple recording of ‘choice’ sales, and many more features are found on this screen. 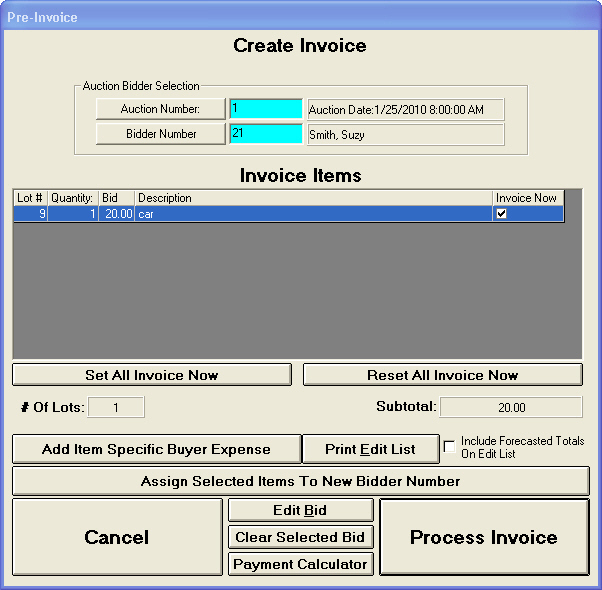 Make use of the “pass-out-bid” button to sell multiple quantities of the same item. 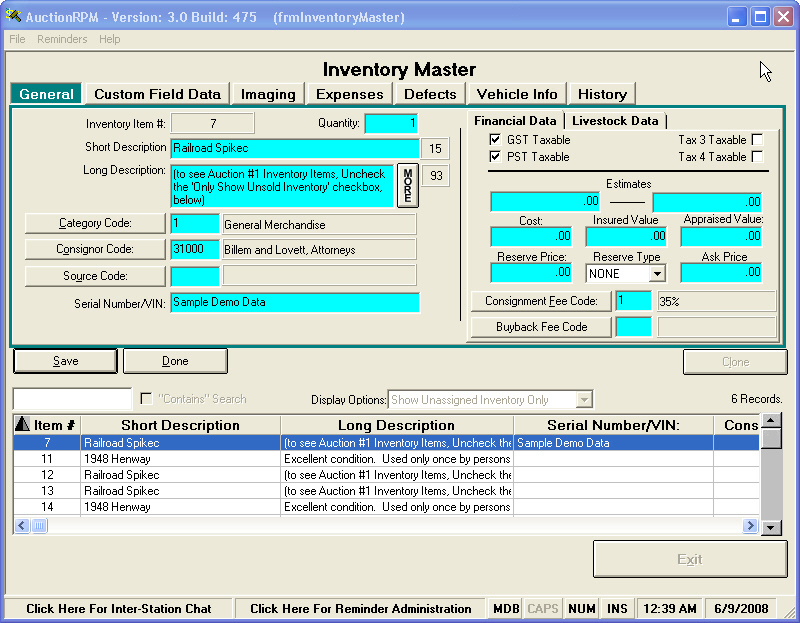 The inventory master is typically used if you have the type of business where you accept inventory to be sold on consignment and you do not know which auction will be used to sell such items. 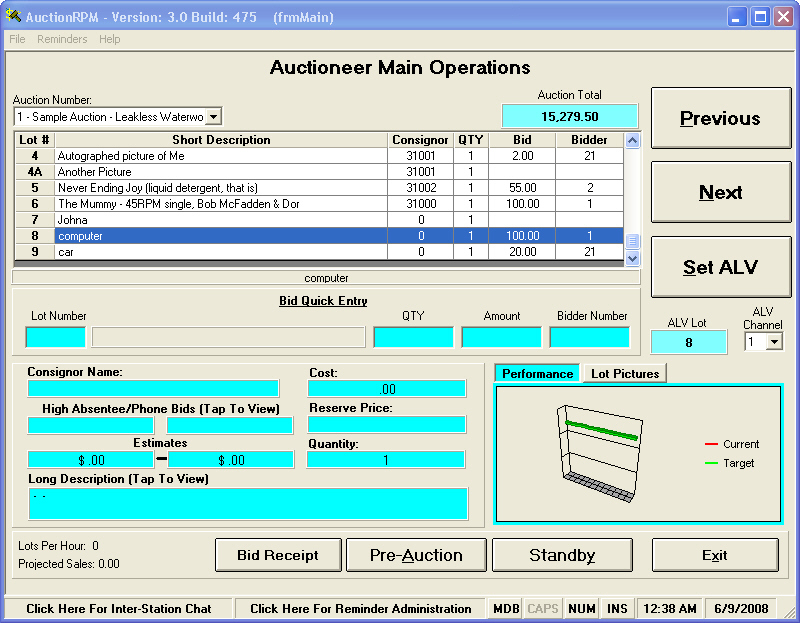 Inventory entered in this screen is made available in the ‘Add/Edit Lots’ screen wherein it can be assigned to an auction with a lot number. 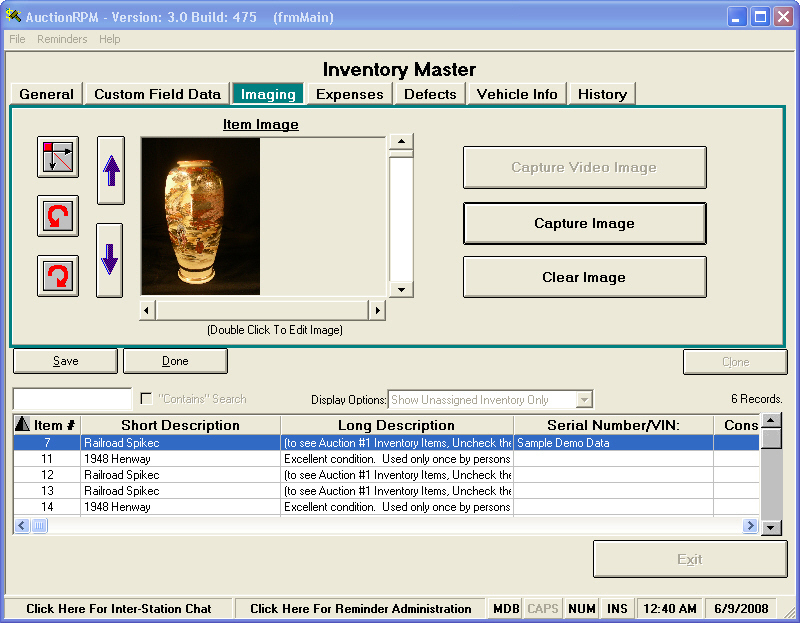 As with many features in AuctionRPM, there are many ways that you can record images of the inventory. One way is to use the ‘Images’ tab in the inventory master screen. As can be seen here, you simply click on the ‘Capture Image’ button and select the images to be associated with the current item. Images can then be displayed in many places. For instance, they can be projected up onto the wall 10 feet tall through the use of the ‘Audience Lot View’ screen. They can be exported to various services such as Proxibid, Live Auctioneers, etc. These images can also be included in the website catalogs that AuctionRPM can automatically produce for you. The auctioneer can control the projector and even get critical information on each item. Invoicing in AuctionRPM is designed to provide maximal functionality paired with a great deal of flexibility with respect to charging expenses associated with the sale of inventory, doc fees and title fees. 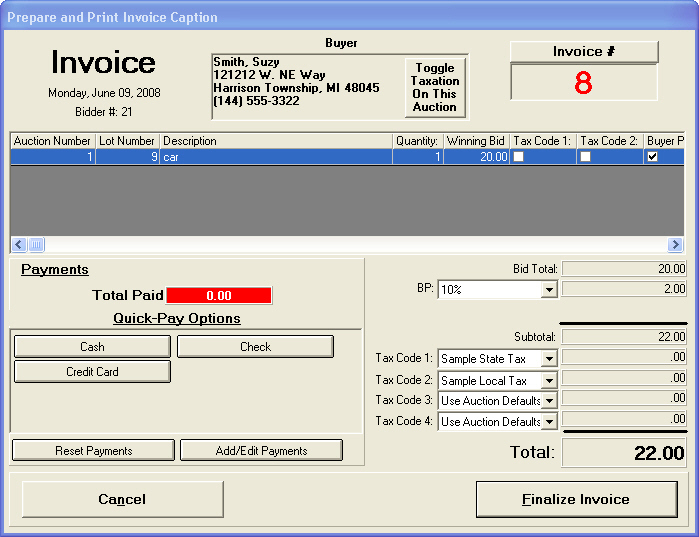 When necessary the invoicing system will verify that the proper tax id is on file and will print out on the invoice itself, as well as optional additional forms such as the gate release or the inventory image summary for items on the current invoice. You will also see your buyers premiums and taxes calculated. 4607 Lakeview Canyon Road, Suite 178, Westlake Village Ca.